People get into debt for various reasons, sometimes for things beyond their control. Though it may not be easy, some debtors will take the necessary steps to resolve debt, learn from their experiences, and make the effort to live within their means. Then there are others who can’t seem to avoid debt, no matter how hard they try. We’ll explore 3 reasons why people get caught up in the cycle of debt and what needs to be done in order to break free. 1. The need to have it all – right now. Who wouldn’t want to drive a fantasy car or live in their dream home? Most of us do, but we may not have the resources to attain them. There’s nothing wrong with having wants and goals, but we have to be realistic about what we can currently afford. One of the reasons people stay in debt is because they feel the need to have everything right away. It may be for appearances sake or an act to “keep up with the Joneses”. However, when we’re not honest with ourselves, it hurts us in the long-run, both financially and emotionally. You may not need to deprive yourself of everything, but your lifestyle needs to be adjusted to one your finances can comfortably support. In other words, don’t spend as though you’re Kanye West when you’re making $30,000 per year. 2. Not saving for the future. Yes, I agree that life is short and we should live it to the fullest. However, I also believe that life can be unpredictable. The more we prepare today, the better off we’ll be in the future , especially when life throws us curve balls. Over the years, I’ve heard countless stories of people racking up debt because they fell on hard times. One couple had been living the American Dream. To everyone, they seemed to have it all, but what many people didn’t know was that they were struggling to maintain their lifestyle. The husband, who had been the sole bread winner, had taken a big pay cut at work. Since they never put money aside for a rainy day, their finances took a huge hit. Instead of downsizing, they clung to the life they knew. As a result, it drove them deeper and deeper into debt. I can’t stress how important it is to have an emergency fund and to also save for retirement. No matter how tempting it can be to spend everything now, your future self will thank you for delaying instant gratification in support of your overall financial security. 3. Not setting a budget or practicing smart money management. The first step to improving your finances is to evaluate where you currently stand. Some people feel uncomfortable talking about money and would rather hold an “ignorance is bliss” attitude. However, knowing the state of your finances and setting realistic goals is crucial to getting out of debt. You have to know exactly how much you owe, where your money is going, and find areas where you can improve. Sort your expenses into categories under needs and wants. Then try to use some of the money that you’ve been spending on wants towards debt repayment. When you have a manageable system in place and get into the habit of following a budget, paying down debt will get easier. In the end, if you really want to stay out of debt, you need to be willing to make changes and sacrifices. Otherwise, the cycle will repeat itself. Change may not be easy, but I can assure you that living with the consequences of debt is much more difficult. If you are ready to deal with your debt burdens, there is help. 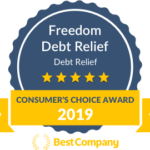 Discover your debt relief options and find the solution that’s right for you!